Our one of a kind Pooh Adventure Baby Quilt Gift Set includes a Pooh Bear rattle toy. There is a new Winnie ther Pooh movie with Christopher Robin as a middle aged adult about to lose his family because of his work. And yes, the "ther" is the correct reference. The reviews mention that adults we forget our childhood friends but I am here to say that's not true. I still have my Squeaker Bear and Panda and Bun-Bun Rabbit toys, reminders of earlier days and friends who will always be with me. That was the inspiration for Pooh Adventure Baby Quilt Gift Set. The baby quilt itself was made into a regular lap quilt throw size because baby-themed quilts are hard to find. The larger 50x60 inch size makes this baby quilt appropriate for the older youngsters on your gift list and can easily be something a baby can enjoy as it grows into a toddler. 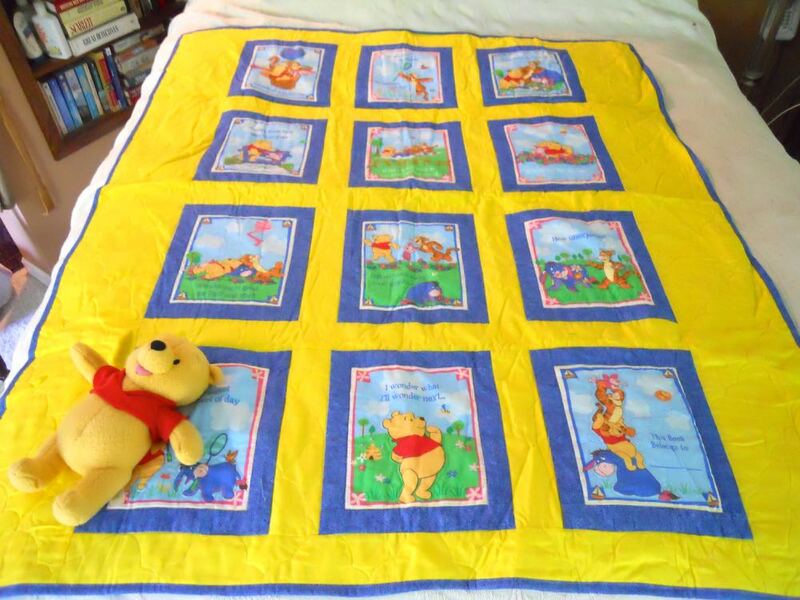 Pooh Adventure baby quilt can also be easily used as a nursery or room wall hanging. The bright colors mean the baby quilt will stand up to a lot of washing without fading as quickly as pastel colors do, and the Winnie the Pooh rattle toy is bound to delight any child. It even makes me smile every time I pick it up. There's also another benefit to this baby quilt, you can easily personalize it by adding someone's name in the "this book belongs to" quilt square. Either custom embroidery or an indelible ink pen will do the trick. And did I mention this is actually a book? What fun to read the different sections. The Pooh Bear rattle will have a quilt care guide and gift card attached to deliver your special message if you want us to ship this directly to someone. Pooh Bear rattle matches this Pooh Adventure Baby Quilt Gift set, ready for hugs. My mother and I used to make and sell Pooh Bear toys. I still have one of them keeping me company in my office, complete with the "Hunny" jars I used to make out of styrofoam balls covered in paper mache. Once dry, I would paint them by hand. Who would have ever suspected then that someday I would actually have bees and real honey. 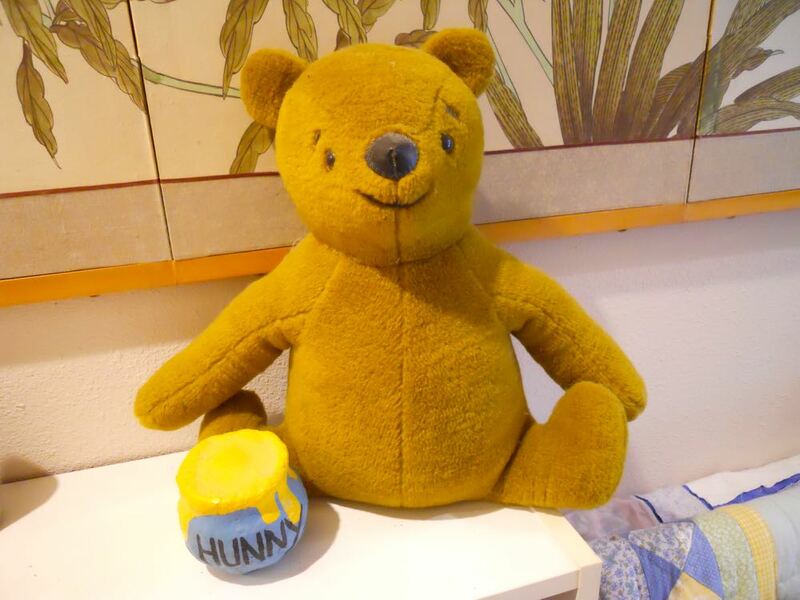 One of my mother's handmade Winnie the Pooh dolls with one of my handmade hunny pots. Notice the colors of the "hunny" pot? Absolutely it also inspired the colors of this Pooh Bear baby quilt gift set!